to strict timeframes for an 90 day build. Eaton worked alongside Carter Sullivan – the main contractor on the build – to deliver a solution based on Eaton’s xEnergy switchgear, Eaton 93PM 120 kVA UPS, battery breakers, transformer, electrical panel components, and cold aisle containment. Eaton also provided a comprehensive service package. 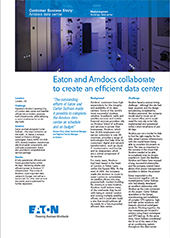 efficient power to Amdocs’ IT infrastructure.